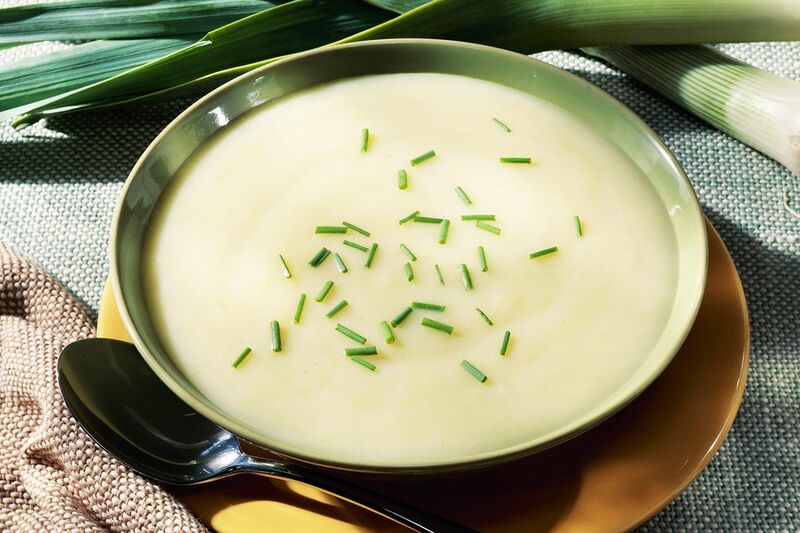 Leek and potato soup is well known and is perhaps the most famous of leek soups. How about a little change, though. Keep the leeks and the potato but add a chunk of delicious Stilton cheese to give the soup added depth and flavor. You will be glad you did. This a warm and filling soup and though good for a cold winter's day is also too good to keep to just one season. The soup is welcome any time of year when the weather is a little chilly. Put the olive oil and butter into a large pan. Over medium heat, carefully melt the butter taking care not to burn. Add the finely shredded leeks and the chopped celery and sweat together for about 5 to 7 minutes or soft and partially cooked. Add the diced potato and the stock. Bring the soup up to a gentle simmer. Cover with a lid and cook for 30 minutes. Remove the pan from the heat and allow the soup to cool for 5 minutes. Whiz the cooled soup in batches in a food processor to create a smooth soup. Add the single cream, the Stilton and blend again. Strain the soup through a sieve back into the pan and push through any lumps. Gently simmer the soup for 5 minutes to reduce and thicken it slightly. Pour the soup into warmed soup bowls or plates, sprinkle with a few finely shredded pieces of leek or chopped chives. Serve with chunky wholemeal bread and real butter on the side. Stilton is by far the best cheese for this soup. However, that does not mean you cannot try something different. Swap out the Stilton for blue cheese, crumble it into the soup as described in the recipe. This recipe calls for a vegetable stock unless you are serving vegetarians, use a chicken stock for even more depth of flavor. Love Leeks as much as we do, then try this collection of our seven favorite recipes using leeks. Want to know more about cheese, here are some of the British classics, some which will make an excellent alternative to the Stilton. This recipe is adapted from one courtesy of British Leeks.